Stanley McMurtry was born in Edinburgh. Attended Birmingham College of Art (1950-53) which was interrupted in 1954 by two years of national service in the Royal Army Ordnance Corps. A freelance cartoonist working under his own name on children’s comics Wham! and Buster and Punch. 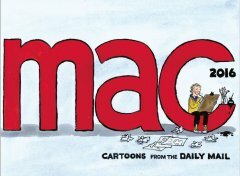 Under his pen name Mac and for over 46 years, Mac amuses the nation with his cartoons for the Daily Mail. He was granted an MBE by HM The Queen in 2003 for "services to the newspaper industry". “In terms of the quality of his drawing and the quickness of his wit, I reckon Mac is without equal.